This Vortex Viper HD 10X42 has HD Lens Elements, XR Fully Multi-Coated, Dielectric prism coatings, and phase correction coatings to provide you with unbeatable image quality. It’s also fully waterproof and fog-proof, has a locking diopter piece, and has ArmorTek for ultimate external lens protection. As a premium and high-end HD optic with a low $500 price tag, I’m sure you’re curious as to how well it does online. Well, it has a solid reviewer base who have given this binocular a near perfect rating and we have awarded it a place on among our recommendations for the best binos priced below 500 dollars. Yes, I know I’m featuring another Vortex 10X42 binocular, but I’m not the one who governs the ratings – that’s all you. Although this has at least double the amount of reviews online versus any other Vortex Viper HD, I can tell you that they all do significantly well. I don’t think it really matters what platform I review here today, it’s more about the quality of the entire Viper HD series. So, if you’re ready to dive into the essence of this high-end, excellent, and premium Viper HD 10X42, here’s a fully detailed review in Q&A style. This Viper HD not only has excellent internal prism coatings that provide an intense and radiant image for you no matter the time of day, it also has an external lens coating to match that of the inside. ArmorTek is Vortex’s proprietary external lens coating to provide the lens with protectant and scratch-resistant qualities… you know, for those times you carelessly let it brush up against a bush without its caps on. ArmorTek not only has ultra-hardening particles in the formula to get surface-hardness to hunter standard, its special ingredients also helps to make sure that oil, debris, water, and dirt doesn’t stick. Just wipe away for a clean surface once again. What is HD Lens Elements? Vortex has used the term “HD” in a double play here. It stands for High Density, as in, High Density Extra-Low Dispersion glass. Now, the effects of having this specially formulated glass provides HD – High Definition – effects. You can expect excellent resolution, sharpness, and color fidelity with the HD elements because of the ED glass. With these components, light scattering is kept to a minimum. This results in less color fringing on high-contrast objects, and it provides a detail-rich image full of true colors from the entire light spectrum. What is the locking diopter piece? The diopter is found on the right eyepiece of the binocular. If you’re new to optics or if you grew up deprived of a life that didn’t involve playing around with a binocular as a kid, then this would be news to you. Here’s a tip: the purpose of the diopter is to focus the lens for your unique eye sight. This is important because everyone has different levels of eye strength. And, it may also be news to you that each eye has differing levels of eye strength as well. This is where the diopter comes in. However, once you’ve got the focus just right, you might end up knocking and bumping it out of place. To avoid having to re-focus your sight again, this Viper binocular just needs to have the locking mechanism put into place. Voila – no more accidental shifts in focus. Are there any accessories included with the purchase? If you’re going to buy Vortex binoculars, then you’re definitely going to get some accessories with your purchase. Expect to see a neck strap, deluxe padded carry case, tethered objective lens covers, and a Rainguard eyepiece cover. And, even though their website doesn’t mention the lens cleaning cloth, there is one included. Just flip open the product manual and there it is. Is there a Viper HD with a larger field of view? This 10X42 has a good field of view of 319 feet, but the shiner of the lot will be a smaller power + objective lens size combo. 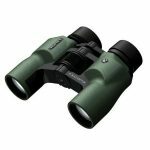 The 6X32 and the 8X32 Viper HD binoculars have an extremely wide 400 and 420 feet field of views. While you’re sacrificing power and objective lens size, you are gaining 100 more feet of a field of view. And, with the HD quality lenses and magnificent image quality, the lack of the former will be well made-up for, especially if you’re birding in forested areas or if you’re a hunter and you need to see fast, moving targets. You’re also gaining a lighter and more compact device. On the other end of the scale is the 10X, 12X, and 15X models with 50 mm objective lens sizes. While they’ve got the exceptional long range distance power and the low light strength thanks to the 50 mm lens, your field of view is going to be within the 200-280 feet range. For birders and hunters out in the open plains, the higher power might just be more valuable than a wider field of view. To glass it up, the Vortex Viper HD 10X42 binoculars are worth their hefty cost. That’s why we put the cost down as a pro. However, there may be some defective items that get bypassed in quality control. We’re not the PR or quality control regulators for Vortex, but if it doesn’t meet your expectations, it’s not the Vortex standard or trend. Simply hit up Vortex with the VIP warranty, and your defective product will be taken care of. The positive trend that does support our findings about Vortex can be ratified with the Vortex Diamondback 10X42 binoculars. They’re excellent in every way. If you couldn’t justify spending close to $500 on the Vipers, you’ll be pleased to know that you’ll only have to spend about half that on the Diamondbacks – if that sounds like a sweet deal, check them out now. Outside of Vortex, you could always check out the Leupold BX-2 Cascades 10X42 binos (which you can read about here). They’re cheaper, but you’d be missing out on all the excellent coatings and glass quality of the Vortex Viper. Your choice though. If you want a dependable, high quality binocular that doesn’t sport Swaro prices, you need a Vortex. Outside of those world-renown brands, Vortex is one of the best you’ll ever come across. Don’t settle for mediocre, go with VIP treatment with VIB (Very Important Brand) quality.